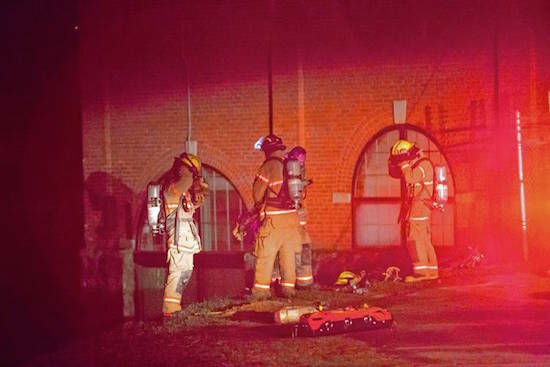 Firefighters gear up at the scene of a fire at the Buckland, MA, hydroelectric plant Sunday. A malfunctioning turbine resulted in a fire at the Buckland, MA, hydroelectric plant Sunday. Buckland fire got the call at 10 p.m. Sunday there was smoke coming from the building. Upon arrival, the departments started sending in teams of firefighters and determined the smoke was coming from a malfunctioning turbine that caught fire, said Buckland Fire Chief Herb Guyette. There were no injuries and no one was inside the building, officials said. During the day the plant’s power went out, Guyette said. In the evening, a smoke alarm went off. The current belief, he said, is because the power was off, one of the valves opened up, allowing water to push through the turbine without it running. This led to the turbine overheating. Then oil on top of the turbine, for lubrication purposes, likely caused the fire. Damage costs are still being calculated, Guyette said. Guyette said about 15 teams of firefighters went into the building to extinguish the turbine. They were able to extinguish the fire in about an hour, but firefighters stayed on scene until around 2 a.m. to clear smoke and help the building’s operators safely inspect the facility, the chief said. Firefighters needed multiple support teams not because of the size of the fire, but because of the unknown, Guyette said. Since he and his crew could not tell the magnitude of the fire inside the building due to the level of smoke. The firefighters did not know what was on fire until they entered the building, he said. The facility is run by Essential Power Massachusetts, Guyette said, citing recent town documents. He said he cannot confirm that the company is the owner. It had been under the ownership of TransCanada. The hydroelectric plant was offline this weekend, Guyette said. It is unknown if the plant was running during the week or has been offline for longer than the weekend. Workers from the plant responded to the scene as well. Typically a dam like this is run remotely, Guyette said. Even if workers were present at the plant, Guyette does not think things would have gone any differently.